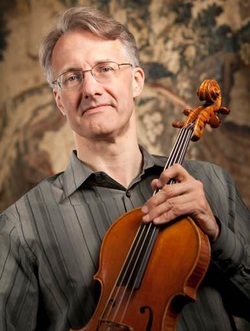 Jonathan Bagg is Professor of the Practice at Duke University, a member of the Ciompi String Quartet. His career with the Ciompi includes hundreds of concerts across the U.S. and around the word, as well as many recordings. Currently co-Artistic Director of Electric Earth Concerts in New Hampshire, he also co-directed the Monadnock Music festival from 2006-2011. Bagg runs the chamber music program and teaches viola at Duke, where he is currently acting Chair in the Music Department. Solo recitals have brought him to many locations in the U.S., including the Phillips Collection in Washington, DC and Boston’s Jordan Hall. Other festivals include the Great Lakes Chamber Music Festival, the Eastern Music Festival, the Portland Chamber Music Festival, the Highlands, NC, Mohawk Trail, and Castle Hill festivals. Bagg’s two solo CDs on Centaur contain music for viola and piano by Robert and Clara Schumann and by Robert Fuchs (1847-1927). Contemporary solo works by Arthur Levering, Malcolm Peyton, Robert Ward, and Donald Wheelock are on Bridge, Albany, Centaur and Gasparo Records. In 2014 Albany Records will release a new CD with solo and ensemble works by Stephen Jaffe, Scott Lindroth. ​Collaborations include many notable musicians, including pianists Menahem Pressler and Bella Davidovich, saxophonist Branford Marsalis, jazz vocalist Nnenna Freelon, and the Tokyo and Borromeo Quartets. Before coming to Duke he performed with many of New Enlgand’s leading musical organizations. He appeared often with the Boston Symphony Orchestra, was associate principal of the Handel and Haydn Society, and principal viola of the New Hampshire Symphony Orchestra. He graduated with honors from both Yale University (BA) and the New England Conservatory (MM), where he studied with Steven Ansell and Walter Trampler.